When Ray Evans was six years old, he and his siblings were all evacuated from Liverpool, which was in danger of being bombed during World War II. They were sent to South Wales in September 1939. Although his mother wanted the children to stay together, it was not possible and they were split up. 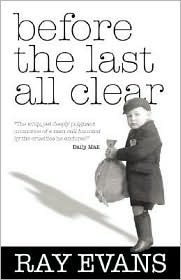 Before the Last All Clear: Memories of a Man Still Haunted by the Cruelties He Endured is Ray Evan's memoir of the time he spent in Wales during the war, the horrible conditions in which he lived, and the situations and people he encountered before finally returning home in 1945. This is an incredibly personal memoir that opened my eyes to situations I never really knew about. When the war began many children were evacuated from areas that were likely to be in the throws of the war. I first read about children being evacuated from one place to another during the war in The Guernsey Literary and Potato Peel Pie Society by Mary Anne Shaffer. That was fiction. This was real life. Ray Evans tells of the many different homes in which he was placed during his time in Wales. The first place was that of a couple. The husband wanted Ray and his brother to stay with them; the wife did not. And she made their lives a living hell while they stayed with her. Then he moved on to a home that was so dirty and miserable he realized he didn't have it so bad at the first place. Evans offers anecdotes about his time in these homes, and in the schools where he was teased, and it breaks your heart to think of how he suffered. But he also provides some lighthearted stories and a glimpse into the last family that took him in, which was so kind he didn't want to leave them. The memoir is written as stories told by a grandfather to his grandchildren, which was the original intention of the book. Evans wanted to put his stories on paper so they would never be lost. The writing style is not refined, and there's a bit of skipping around in terms of time frames, but the stories Evans has to tell are definitely worth hearing. This review was written based on an ebook copy of Before the Last All Clear that I received from the author in exchange for an honest review. The author has graciously offered a copy of Before the Last All Clear as a giveaway for one of my readers. To enter, just leave a comment below with your email address. The giveaway ends at 10:00pm EDT on October 17, 2011. I enjoyed this lovely slice of social history from Ray Evans. I agree that although the novel skipped about the timeframe, it came across just a grandfather would tell those stories to grandchildren. Lovely review. Would love the opportunity to read. This made me think of The Lion, The Witch, and the Wardrobe. Clearly that was fiction, and most children probably did not land in as nice of a house as the Pevensies did in that novel. I'd be interested to read about what it was really like. I recall reading about someone who had a very bad experience after being evacuated from London, but I can't remember if it was fiction or nonfiction, now. Well, at any rate, this book sounds fascinating. I'd love to read it. Thanks for the giveaway!